Slimbridge Dowsing Group Christmas party. the Christmas Four Tables event. A bit of continuity in these precarious times can be quite comforting and welcome. So this year we continued our ancient tradition (started last year) of having Four Tables for the Slimbridge Dowsing Group Christmas party. No, this isn’t so we all have lots of elbow room over the festive turkey, it’s four tables with various items for us to try out our dowsing skills. One member brought along three bottles of home-made wine and we had to dowse to see what it was made from (nettle, parsnip and gooseberries); how strong proof it was (a blistering 18–20%! ); and what caused the cloudiness of the golden nectar. The answer to this last was iron, because the wine-maker had collected pure (free) water from a Malvern well and it is rich in iron. Not many of us got that right. Continuity and tradition dictate that we’ll all have another go at Christmas 2010, and that includes the glass of fizzy bubbly and festive nibbles afterwards. Our meetings in January include Thursday 14th when Dr Fiona Firth will talk about Acupuncture, an alternative therapy once regarded with deep suspicion by us Brits. This Chinese skill is now around 5,000 years old and available on the NHS. It’s taken us a while to catch on but now we love it. 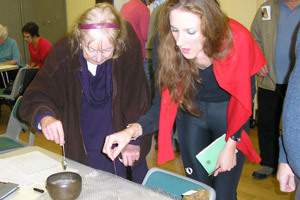 And on Saturday 30th January we hear about Crystal Healing from Beverley Casey Power. Crystal healing works by placing crystals of the appropriate colour and energy on the corresponding Chakras of the body to cleanse and energize and can help mental, emotional and physical conditions.